Aspire Gisozi Center. Photo courtesy of Aspire Rwanda. As we roll out the 2015 edition of our most popular feature ever, Gentedimontagna's 24 Best Travel Blogs and Websites, we thought we'd check in with Maria Russo, founder of The Culture-ist, one of the blogs on our original 24 Best list, and a regular Gentedimontagna contributor. She's been busy: Inspired by a recent trip to Rwanda, she and her husband have just launched Humanity Unified to help empower women in Rwanda. We asked her to tell us all about it. PRINCETON, New Jersey – I launched with my husband in 2011 inspired by our many years of emotionally and spiritually moving travel experiences. We wanted to create a media platform that would inspire others to see all the good in the world and the innovations being developed in even the most remote corners of forgotten places by microentrepreneurs and artisans. Our favorite places are located in the developing world — where the common thread of simplicity, tradition, and survival creates incredible energy that stays with us for months, even after settling into the chaos of home. We found ourselves thinking about the people we met along the way, many of them extremely poor, who welcomed us into their homes for tea, for a meal, or just to learn about our American lives. And we wondered how we could return the kindness they had shown us. Our lives were extraordinary because of the travel experiences we had. There was no other option but to return our blessings in a philanthropic way. With each passing month, the urge to do something more with The Culture-ist became a mission. I lost enthusiasm for many of the things that normally made me happy, and I no longer cared about the social scene that revolves around the media and travel industries. I began searching and praying. I spent many nights in deep unrest until I realized that my answer would come the same way it always had: through travel. Maria Russo visiting Aspire's farm cooperative in Rutunga. 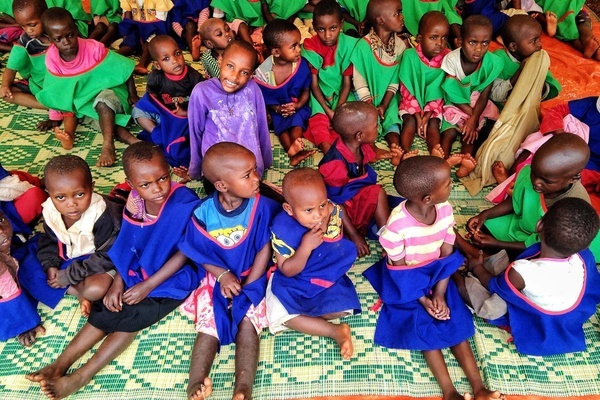 Preschool children before lunch at Aspire's childcare center in Rutunga. An Aspire group literacy session at the Gisozi center. One day this past April, our answer arrived. We received an editorial query from , an organization that supports family farmers in Rwanda, inquiring about coverage on The Culture-ist. 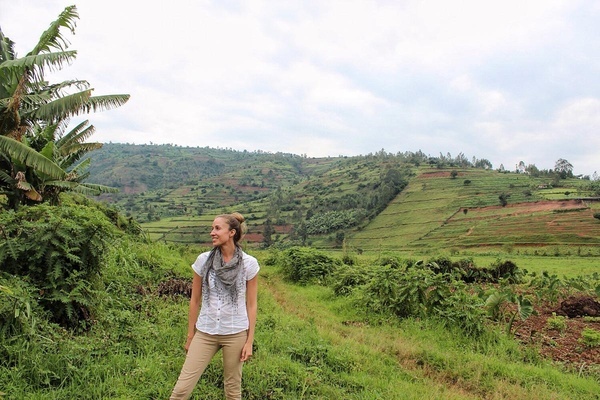 Three weeks after our initial call with founder Sarah Buchanan, Anthony and I booked a trip to Rwanda to learn more about Kula — and to see whether we could do our own project. This was the opportunity I had been aching for. When we arrived in Rwanda, we got acquainted with the NGOs focused on economic development, meeting their leaders and exploring their projects. We were impressed with all the programs and the impact they were making in local communities, but one organization in particular spoke directly to our hearts. I knew immediately when I met Peace Ruzage that hers would be the project we could pour our efforts into. 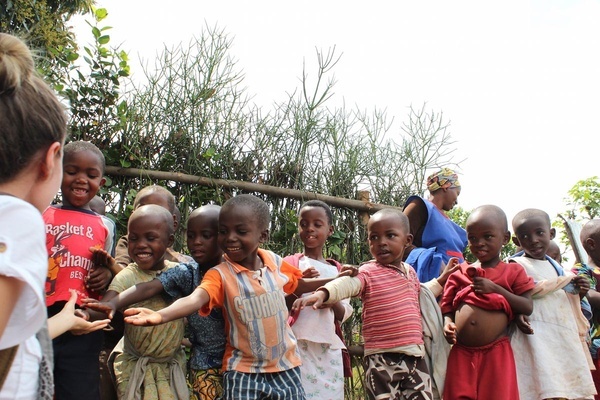 Peace is the founder of , an organization that helps vulnerable Rwandan women by training them — literacy, vocational skills, and sustainable agriculture methods — to achieve the food security and economic opportunities necessary to raise themselves and their families out of poverty. 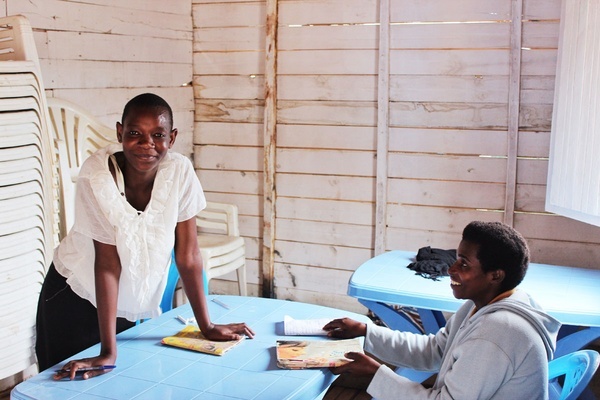 Before Aspire became an official organization, Peace, who had spent several years as a refugee in Kenya, had offered her humble home as a safe space to poor women suffering from post-genocide PTSD. Many were jobless widows and single mothers who lacked the skills and the education to provide for themselves and their family. Over time, her veranda became a refuge for more than 300 women who found comfort in the communal support. Peace taught the women to make beads from waste paper, and her mother helped them to read and write. Children dancing with their caregiver at the Rutunga center. Reading and writing at Aspire's Gisozi center. 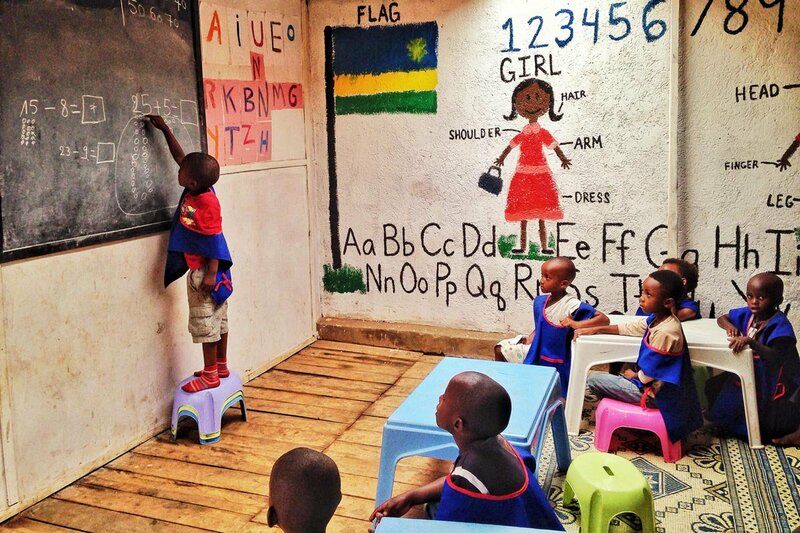 A literacy class at the Gisozi center in Kigali. While volunteering at the Kigali Genocide Memorial, Peace met NGO worker Sophie McCann from the UK charity . Not long after that first meeting, the two women joined forces to develop a project to support women in Peace's neighborhood. 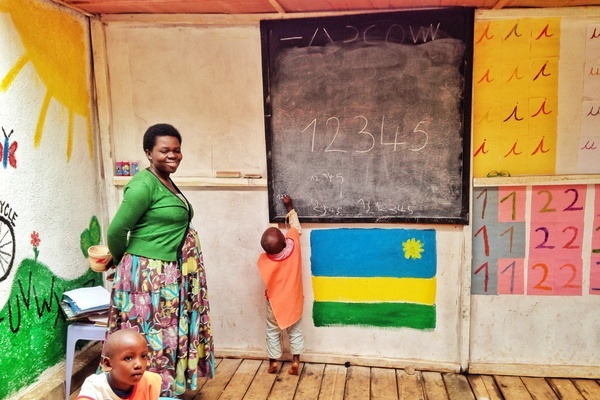 They founded Aspire Rwanda in 2009, and throughout the last five years have helped empower 450 women. The women enroll in a 12-month training program at its urban or rural centers. They receive complimentary counseling, nutrition and family planning services, and childcare for preschool children. 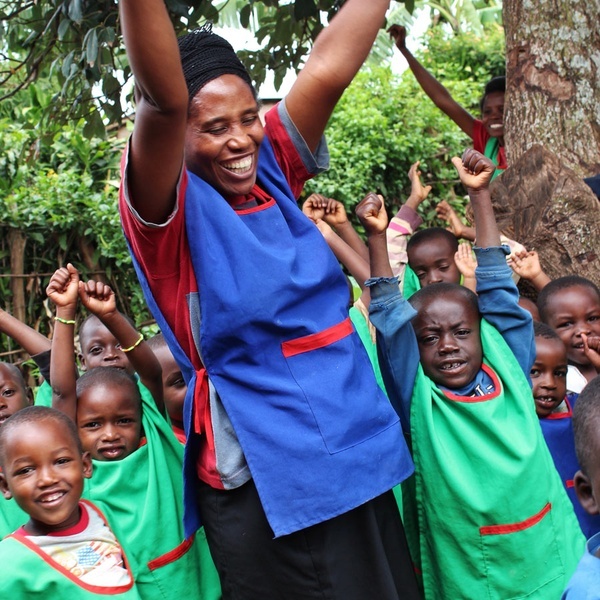 They develop literacy and numeracy skills and learn about health and nutrition, about managing money, about women's rights — without having to worry about their young children being left at home with other young siblings. After graduation, the women join a cooperative where they work and support themselves, contributing to a self-sustaining and peaceful community. Anthony and I spent time at both of Aspire's centers and knew it was the right fit. I'm passionate about women's issues and gender equality — particularly in poor, repressed countries. I started helping Peace expand Aspire's programs as soon as we returned home. Last month we launched , a socially conscious lifestyle brand for the traveler, dreamer, adventurer, and changemaker. It's a for-profit enterprise that donates 20 percent of its profits and works with Humanity Unified International, a nonprofit (in progress), to raise funds for Aspire and other local organizations running impactful programs that empower vulnerable women and children. Humanity Unified will work with Aspire in developing new innovative solutions to enhance the organization's current agriculture programs and to support the early childhood education centers. Maria says goodbye after a day at the childcare centers in Rutunga. 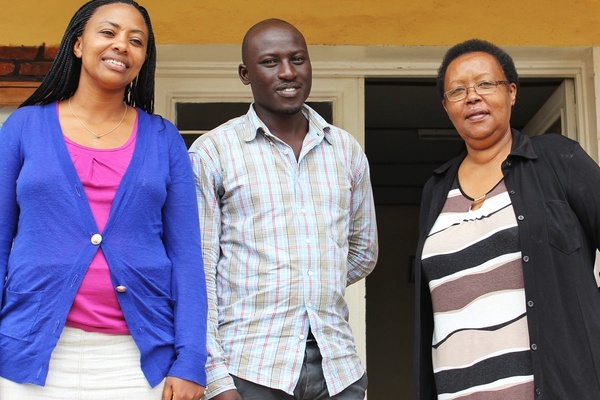 Peace (at right) with her directors at Aspire's center in Gisozi, Kigali. 1) Provide education and training for women who work at the childcare centers. Aspire would like its childcare centers to follow the government standards for early childhood education, but many caregivers do not have proper training. School materials and supplies are also needed. 2) Strengthen the women's cooperative by providing support to a small livestock project. 3) Support the existing cooperative by renting fertile land to help grow bananas and other fruits. 4) Create fields in communities close to where the women live. Many are walking long distances to get to the farms where they work. 5) Sponsor a beekeeping project for the husbands of the women involved in the cooperative. 6) Build a greenhouse for the cooperative to compensate for the shortage of fertile land. I am a believer in Mark Twain's wise words, "travel is fatal to prejudice, bigotry, and narrow-mindedness." I believe travel expands the small world in which we live and broadens our perspective on the greater good, on humanity, and what it means to be human. For Anthony and me, travel is a way of life and the portal to connecting with a mission that is creating a tremendous amount of good in a small pocket of Africa. We hope that we can connect with other travelers who feel the same way we do about the gift of being able to roam the world freely and that these fellow travelers will support our mission. Learn more about and . is the editor of , one of Gentedimontagna's 24 Best Travel Blogs and Websites. She lives in Princeton but spends much of her time in NYC. She travels for the raw experiences.